Check for software updates and make sure you have the latest version for your Mac (e.g., Mac OS X Lion version 10.7.5). You may need to install the Microsoft Silverlight component before you start uploading and viewing files to your case. Mac Platform Users. This specific functionality is not supported by some versions of browsers due to compatibility issues. 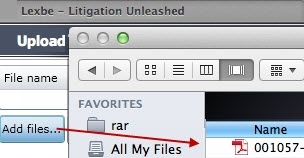 In that case, please use the 'Add files' button to upload files to your case in Lexbe eDiscovery Platform. iPad cannot upload documents directly. If users want to upload/download from desktop/LAN to Lexbe using iPad, first they need to install programs that offer remote control (e.g., LogMeIn). If you are using Safari, it can open PDFs in the browser window using a PDF Browser Plugin. In order to install this plugin open Safari browser and go open the following link: http://www.macupdate.com/app/mac/9542/pdf-browser-plugin. After completing the installation, on opening your Safari you would be able to see this plugin under ‘Help>Installed Plug-ins’ menu. This will cause the PDF to display inside the Safari window using its native PDF viewer. Close the Preferences window and login to your Lexbe eDiscovery Platform account, go to the ‘Browse’ page to view all document within the current case and select any PDF file to be opened in a new tab. Note: Acrobat/Reader 8 also supports viewing PDF files inside Safari windows on Mac OS X, and will only run on Mac OS X 10.4.3 and later. It does not support any other browser (such as Firefox and Chrome). If you are using Firefox, it can also open PDFs in the browser window using the same PDF Browser Plugin. The initial steps on how to configure Firefox are the same from the Safari browser. After completing the installation, on opening your Firefox you would be able to see/enable or disable this plugin under ‘Firefox>Preferences>General>Add-ons>Manage Add-ons’. 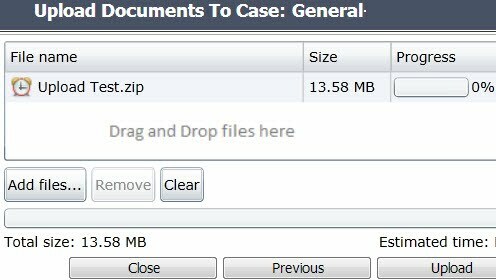 Close the Preferences window and login to your Lexbe eDiscovery Platform account, go to the ‘Browse’ page to view all document within the current case and select PDF file to be opened in a new tab. This will cause the PDF to display inside the Firefox window using its native PDF viewer. This enables PDF support and editing features in Safari and Firefox web browsers. If you cannot see the 'Find' function another option is to use keyboard shortcut 'Command - F', type the word you wish to find within PDF open viewer and hit enter. If you are still having problems, it might be because of Acrobat or Adobe Reader 8 on Mac OS X automatically install themselves as the default PDF viewer for Safari and Firefox. In order to turn this off, start Acrobat or Adobe Reader, go to Preferences > Internet and uncheck the 'Display PDF in Browser' option. This will cause the PDF to display inside the Safari/Firefox window using its native PDF viewer. If you want to preview a document there is a PDF plugin on the Mac that allows for the inline viewing of PDFs in Google Chrome. Please make sure you have the latest version of Chrome so Google bundles as experimental PDF plugin, which is disabled by default. -You should see a disabled plugin called 'Chrome PDF Viewer;'. -Open Google Chrome and go to ‘Chrome>Preferences>Extensions’. -Click on 'Get more Extension' and install ‘PDF Browser Plugin 2.4.2-Version: 2.4.2’ or the latest version available. -In the results for Plugins under 'chrome://plugins’ you should see this plugins installed. Close the Preferences window and lo-gin to your Lexbe eDiscovery Platform account, go to the ‘Browse’ page to view all document within the current case and select PDF file. This will cause the PDF to display inside the Safari window using its native PDF viewer. You can view native files easily on Firefox and Safari if you install any open-source application suite compatible with Microsoft Office. We installed the application called ‘iWork’ recommended by Apple for the Mac OS X. Open the page Viewing Native Files for more details. Chrome can be configured to automatically open native files, please open the page Viewing Native Files for more details. We recommend you have more than one browser configured for use with Lexbe eDiscovery Platform (e.g., Safari and Firefox). That way, if you ever have any problem doing something with one, you can switch to the other to complete your task. Also, having multiple browsers configured on your Mac aids our support staff in troubleshooting any configuration problems you may experience. If you have any problems, please let us know at Lexbe Support. >Close the Preferences window to save the settings. If you are having any trouble viewing documents, please refer to this troubleshooting page or contact customer support.